This splendid vacation showcases France’s exciting scenery, history, and culture as you sail along its beautiful rivers. Embark in Paris and head northwest along the Seine River up to the picturesque Normandy region. Dock at Vernon and choose between a guided visit of Claude Monet’s stunning gardens at Giverny or remarkable Bizy Castle. Continue to Les Andelys—home of Château Gaillard, built by England’s King Richard the Lionheart in 1196—and enjoy a guided walk. In Caudebec, choose between several excursions: an excursion along the Thatched Cottages or Normandy Abbeys routes, and an excursion to the Normandy landing beaches or “A Taste of Normandy.” On to Joan of Arc’s historic Rouen, then in Conflans, choose between a guided excursion to Vincent van Gogh’s Auvers-sur-Oise or Napoleon and Josephine’s elegant Château de Malmaison before heading back to Paris for guided sightseeing or a “Heart of Paris” walk. Disembark and ride the TGV train to Dijon, then travel south to fascinating Beaune for a wine tasting or visit of the Hôtel-Dieu. 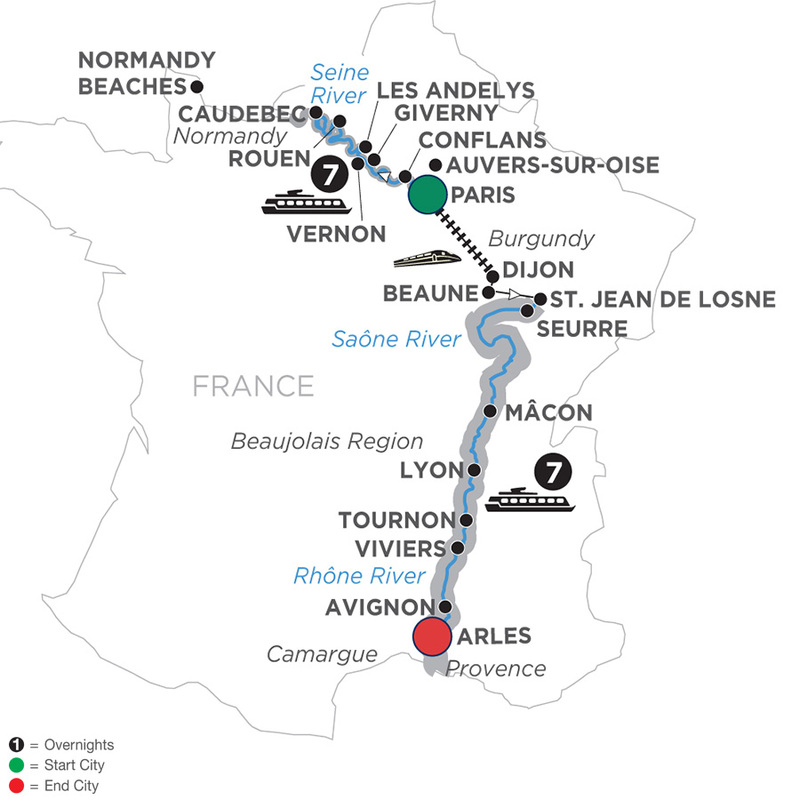 In Chalon-sur-Saône, board your second cruise ship and sail on to medieval Tournus, France’s gastronomic capital of Lyon, the twin cities of Tournon and Tain l’Hermitage, Viviers, and Avignon. Sail into the picturesque Camargue region (daylight permitting) before disembarking your ship in Arles for the conclusion of your vacation. Flights into Paris must arrive by 2:30 pm. Guests must be on board ship by 5 pm.